E. Lawrence, better known as Larry, Packard began his golf architecture career in Illinois in the 1940s with one of the founders of ASGCA, Robert Bruce Harris. Packard started his own firm in 1954 with Brent Wadsworth. Wadsworth would go on to a successful career as a golf course builder, receiving the ASGCA Donald Ross Award in 1993. Not limiting his work on more than 600 golf courses to North America, Packard also designed and renovated many courses internationally, working in countries such as Egypt, Guatemala, South Korea and Venezuela. Born Nov. 15, 1912 in La Grange, Illinois, Packard received a Bachelor of Sciences degree from the University of Massachusetts and became an ASGCA member in 1964. 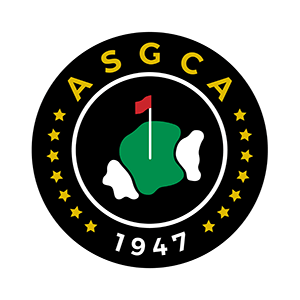 The moniker “Father of the Modern ASGCA” was given Packard by ASGCA Executive Director Emeritus Paul Fullmer due to Packard’s service to ASGCA and its members. Packard served as ASGCA President in 1970-71. Packard was one of the first architects to vocally address environmental concerns, an early advocate for using effluent for course irrigation. Packard later became a Fellow in 1982. Fullmer: "Larry Packard was one of the first of the 'new wave' of landscape architects to join ASGCA. He later became a prime mover in ASGCA setting up our offices in Chicago. He impacted golf, golf course design and ASGCA."